Whether you are heading out this month to the New York State Sheep and Wool Festival, Wool Week in the UK, or one of the many other wool festivals around the globe — or if you are just wanting to find which wool is right for your next project — you will definitely find the The Field Guide to Fleece: 100 Sheep Breeds & How to Use Their Fibers helpful. 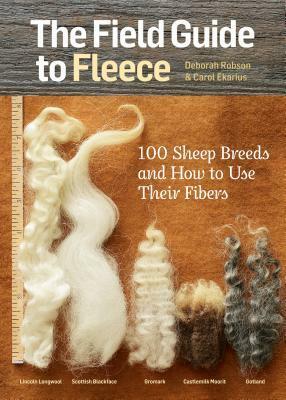 The Field Guide to Fleece is written by the same authors that brought you The Fleece and Fiber Sourcebook. It is a handy little reference book and is the perfect size to stick in your bag. The guide includes 100 sheep breeds, the characteristics of their fleece, and the kinds of projects for which their fleece is best suited. Each breed profile includes a photo of the animal and information about its origin and conservation status, as well as the weight, staple length, fiber diameter, and natural colors of its fleece. It also includes the best ways to prepare the fleece for spinning, how the fleece will take on dyes, and the best uses for each type of wool.